Egypt is famed for its ancient civilization; the name alone evokes images of pharaohs and giant pyramids. A transcontinental country, linking North Africa to the Middle East, Egypt is bordered by Libya, Suda, Israel, and the Gaza Strip and has coastlines on the abundant Red Sea and the Mediterranean. Its capital is Cairo, where visitors can experience the splendor and mystery of the Great Pyramids, perhaps Egypt’s most iconic sight. Other important cities include the port city of Alexandria, located on the northern coast, and Aswan, a city on the River Nile, known for its archaeological sites such as the Philae temple complex. From the dusty, dry lands of the Sahara Desert to the sunny shores of the Red Sea, world-renowned for its coral reefs, Egypt is a country of contrasts. The national language is Arabic, spoken by the majority of the 95 million inhabitants. Much of the population is concentrated in cities, towns and rural communities along the fertile Nile Valley and Nile Delta, the only arable land in the country. On a holiday to Egypt you can expect to be greeted by warm hospitality; locals will often invite visitors to share strong Arabic coffee with them. 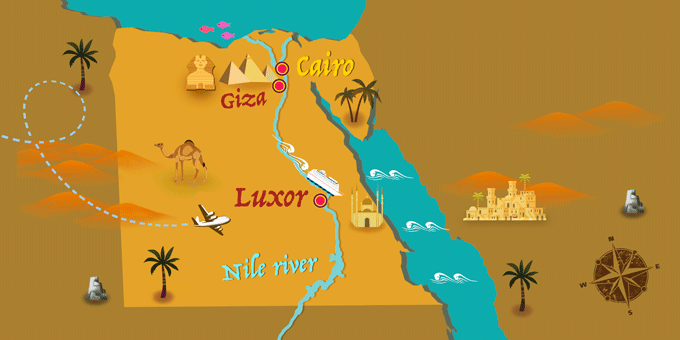 Undoubtedly, Egypt boasts one of the longest histories in the world, spanning back to at least the 4th millennium BC. Sometimes cited as the ‘Cradle of Civilisation’, the country appeals to travelers for its ancient monuments, which are most abundant around the fertile Nile Valley, and include treasures such as the Giza Necropolis, the Valley of the Kings and the iconic Great Sphinx. Ancient Egypt, the famous epoch in history, still immortalized today in literature and film, is heralded for its amazing progression in language, writing, architecture, organized religion, agriculture and government, with the earliest known hieroglyphics estimated to date to around 3200 BC, and the first pyramid structures thought to have been built in around 2700 BC. The first unified Ancient Egyptian kingdom began in 3150 BC and reigning dynasties continued for almost 3000 years, with different kingdoms and intermediate periods within this time frame. The most well-known pharaohs, such as Tutankhamun and Ramesses II were present in the period of the New Kingdom, between 1550 and 1070 BC. During this unique time in the country’s history, Egyptian culture, religion, and traditions flourished. Concepts and practices, such as the after-life, mummification and cosmic order were popular at the time and still ignite the imaginations of historians and everyday people in the present day. Fast-forward to today and Egypt is a predominantly Muslim country, although it was an early center of Christianity, before the 7th century. Despite a turbulent history of occupation, the nation declared independence from the British Empire in 1922, although the influence of the empire remained until the revolution of 1952. For travelers wishing to experience one of the world’s oldest civilizations, a package holiday to Egypt allows visitors to walk in the footsteps of the pharaohs and immerse themselves in the splendor of times gone by. More than 90% of Egypt’s land consists of desert areas, with an extremely arid climate and a near-impossible challenge of growing crops or sustaining life outside of the Nile Valley or in the rare oases such as the Siwa Oasis and the tropical paradise of the Dakhla Oasis in the Western Desert. The other-worldly sand dunes of Egypt’s deserts once acted as protection to the kingdom of the Pharaohs from the threat of western invaders. The urban centers of Cairo, Alexandria, and Aswan contrast with the idyllic Red Sea resorts of Hurghada and Sharm el Sheik, popular with holidaymakers for their up-scale hotels and scuba-diving opportunities. In fact, the coral reefs of the Red Sea are some of the most biodiverse in the world, and the exceptionally clear waters are perfect for admiring the marine life which inhabits the reefs such as Clownfish, Pufferfish, Butterflyfish, the impressive Lionfish and the colorful Emperor Angelfish. Perhaps the most famous natural attraction in the country is the mighty River Nile, the longest river in the world, which spans the country from north to south. The yearly floods of the river, which historically fertilised the Nile Valley and nourished precious crops, has been halted since the completion of the Aswan Dam in 1970, changing the agricultural practices in the area ever since. Today, Nile river cruises are an extremely popular choice for visitors wanting to experience the changing landscapes of the Nile Valley and the historical monuments and sights along the route. In contrast, the backdrop of the snow-covered Sinai mountains in the peninsula of the same name provides a unique sight in an otherwise warm, sunny and dry climate. Egypt is a sightseers paradise, with a multitude of exciting sights to discover. At the top of most lists is the Giza Pyramid Complex, on the outskirts of the capital of Cairo. Here, visitors can explore the three great pyramids, the site of the workers' town, where the builders and engineers of the pyramids lived, and the famous Great Sphinx. This complex is considered the oldest Ancient Wonder in the world, and, amazingly, the only one of the wonders still in existence today. Through sheer workmanship and labor, these great pyramids were constructed to house the remains of the famous Pharaohs and to store the items that were considered necessary for the deceased to successfully survive in the after-life. Located close to the Sudanese border, the temples of Abu Simbel are another of the remnants of Ancient Egypt considered to be an unmissable sight on a trip to Egypt. Constructed by Ramesses II, the temples are carved into the rock face and feature statues of gigantic human figures and intricate hieroglyphic carvings. Finally, the Valley of the Kings stands out as a must-see destination for the significant role its excavation has played in the understanding of the ancient Egyptian civilization. It was the main burial place of the most famous royal figures of the New Kingdom, and since its discovery at the end of the 18th century, and the subsequent discovery of the tomb of Tutankhamun on the site, it has been shrouded in much mystery and intrigue. A tour of Egypt is the perfect way to immerse yourself in the country’s fascinating history and heritage and to experience the sheer scale and majesty of a number of the world’s most famous archaeological sights. Back in the era of the Pharaohs, Egypt led the way in the arts, creating the first synthetic color pigment, ‘Egyptian Blue’, and inventing various unique design codes and practices. Today, the country is one of the Arabic cultural trendsetters, and a leader in the cinema industry throughout the Middle East. Egypt also has a rich musical tradition, with influences from both the Mediterranean and Africa, and is famously the birthplace of belly dancing, the characteristic dance of the region. In literary fields, Egypt has stood out for producing the first Arabic language writer to win the Nobel Prize in Literature, the author Naguib Mahfouz, who was awarded the prize in 1988 for his numerous works, many of which are set in Egypt. Of course, with such an impressive history, the culture of the country has strong links to the past and these elements are proudly showcased in its grandiose cultural institutions, such as the colossal Egyptian Museum in Cairo. If you dream of immersing yourself in the worlds oldest civilisation, walking in the footsteps of the the greats, such as Tutankhamun and Ramesses II, and exploring a country rich in natural beauty, from the Red Sea to the Sahara Desert, a holiday to Egypt is an unforgettable experience, and the perfect choice for lovers of history, nature and culture. Valid passport with at least six months validity. One passport page required. A visa is required. Issued on arrival in the country or you can obtain an e-visa.